Forget about junk mail and take your time to read the emails that really matter. 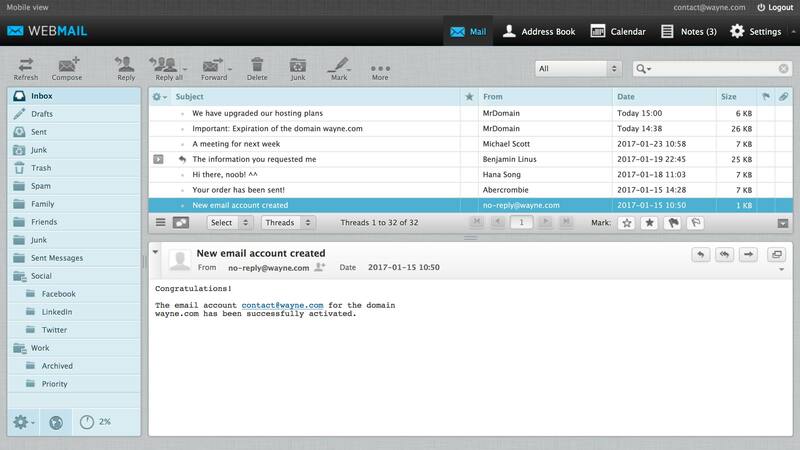 Access all your email accounts from anywhere with a preinstalled web app. Take advantage of your domain with web space to publish static html files. Try your email for 30 days and if it doesn’t convince you we refund you the money. Take care of your online image with custom email accounts like @yourname.com that will allow you to be easily recognized and give a more professional image. You can read and send emails from our Webmail app, accessible with any web browser with Internet connection, including your smartphone. Since you are going to register a domain name to customize your email accounts, why not get more out of it? With your email plan you will have 100MB of space to publish static html files. You can customize a parking page with your logo and contact details, or redirect your visitors to a Facebook, Instagram or Linking page, for example. Do you want your own website? Purchase one of our web + email plans and you’ll be able to create your own website with our assistant or install more advanced apps like WordPress, Prestashop or Magento starting at only 25€.